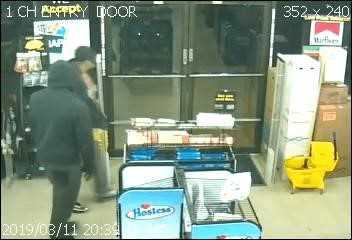 Police have released surveillance photos from recent robberies of Dollar General stores in Wichita, and they’re asking for help from the public in identifying the men seen in the photos. A Dollar General store in the 1600 block of South Rock Road was robbed by two men Monday evening, March 11th. One of them pulled out a handgun and demanded money, and the clerks gave them cash. No one was hurt. 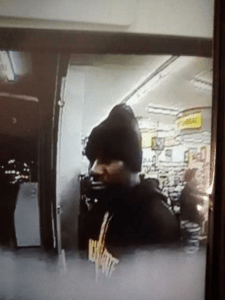 The other robbery was reported around 7:55 p.m. Tuesday at a Dollar General location at 1918 East 13th. A man walked out of the store with several items that he did not pay for, and he made a threatening comment to an employee. He got away in a silver four-door vehicle with an unknown Oklahoma tag. Anyone with information on the robberies is urged to call Crime Stoppers at 267-2111 or Wichita police detectives at 268-4407. Above photo is from the robbery on 13th.